With the busy holidays underway and the New Year “New You” fast approaching, people might slack off, kick up or kickstart their workout regimes. Whatever the case, it’s important to take note of how much physical activity you’re undertaking – as too much can put a strain on your body, leading to overuse injuries. 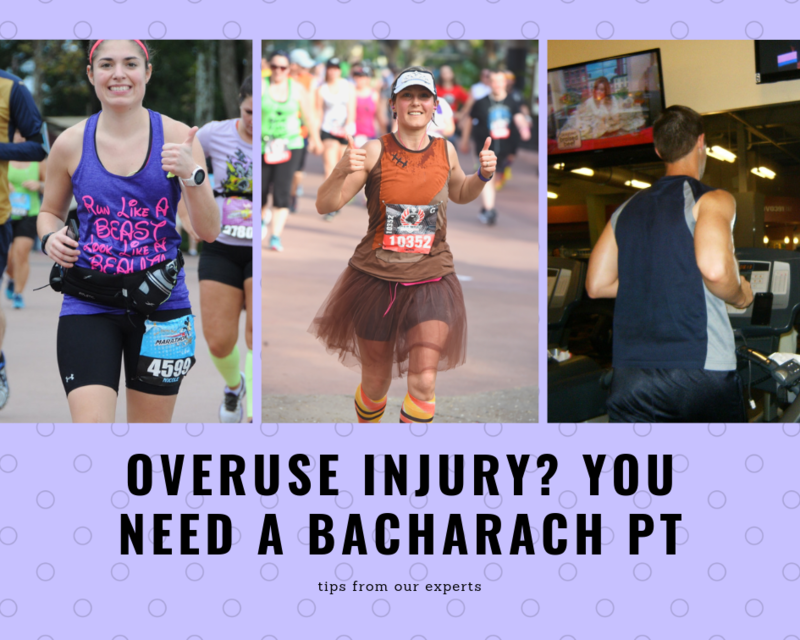 So, what is an overuse injury? It refers to any type of injury that results from repetitive micro-trauma to the tendons, bones and joints. The American Medical Society for Sports Medicine reports that approximately 45.9% to 54% of all sports injuries result from overuse. Area residents with overuse injuries are turning to Bacharach’s highly skilled team of Physical Therapists to help them get on the road to recovery and back to their normal activities. PTs first evaluate the individual in order to pinpoint the dysfunction, then create a treatment plan which may include: range of motion exercises, manual therapy, stretching, bracing, taping and various modalities. Nicole Piela, PT, DPT, clinical director of Bacharach’s Mays Landing satellite location says the first sign of an overuse injury is pain – pain to the touch, pain with certain motions, pain that doesn’t go away and increases while playing the sport. “It’s very important for coaches to know the correct mechanics of their sport. They should also be aware of all the specific limitations for their team’s age group – such as pitch counts, and the recommended number of hours spent training,” says Nicole. Athletes are not the only ones experiencing some pain – people working at desk jobs, construction sites and many other settings are also vulnerable. To prevent injuries, active individuals should give their body a break and get plenty of rest in-between training periods. If you’re returning to a sport or activity, or just starting out, don’t go too hard, too fast. Ease yourself back in by adopting a cross-training workout to avoid overextending certain groups of muscles. If you’re unsure about your workout level, talk to a coach or an athletic trainer about proper training and technique. In the event that an overuse injury occurs, the AOSSM recommends applying ice to the affected area. Anti-inflammatory medications may also be taken at your doctor’s discretion. Old injuries, incompletely rehabilitated injuries, or other anatomic factors. While the holidays may be a whirlwind rush, your training regime doesn’t have to be. Rest up, slow down and train smart!